String Quartet in E Minor, Op. 59, No. 2 "Rasumovsky Quartet No. 2"
A terrific performance and the equally rare chance to hear one of Europe's most thoughtful Ensembles. 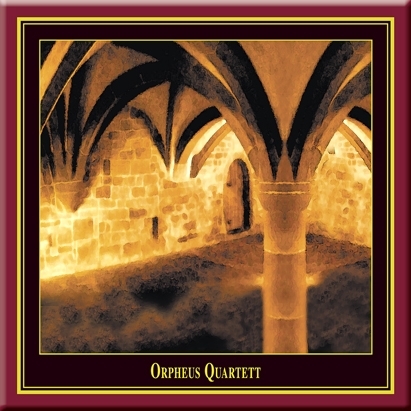 I first heard the Orpheus Quartet in Spain and have collected their studio recordings. I was eager to hear them again, and K&K's series of live concert recordings from Maulbronn has given me an opportunity to hear how they were playing two years on. However, whilst writing this review, I am saddened to learn from the Orpheus Quartet website that their leader, Charles-André Linale, was killed in a car crash last month. Chamber music is given in the lay refectory, and reverberation is long during pauses after Beethoven's sf chords, but you soon get used to that, and it is more than compensated for by the bloom on the sound - you have a real feeling of being there with the audience. The Orpheus four have exactly the right feeling for the not-easy Schubert Quartettsatz and Beethoven's Op. 59/2, which can be a long haul; with all repeats, it was gripping from beginning to end. In this June 2002 concert their novelty was a quartet by Sandor Veress, an excellent composer heard infrequently in UK. Without any studio editing, the accuracy of these performances is remarkable and testifies to the good health of this top string quartet in what, it transpires, will have been one of their last recorded concerts with their multinational founder members; the exceptional performance of the Beethoven a worthy memorial for Charles-André Linale.